The criminal defense attorneys of SLG Law often get calls from people asking us what they can and can’t do when it comes to recording people. A mother in Virginia recently found out the hard way that recording someone without their knowledge can lead to felony charges. According to the article, the mother was concerned about another child at school bullying her child. She wanted to get proof of the bullying, so she sent her child to school with a recording device. Recording devices are prohibited at the school and school officials discovered the device. Subsequent to an investigation, the mother was charged with a felony for violating state law relating to recording someone’s communications without their knowledge. So, what about here in Jacksonville, Florida? 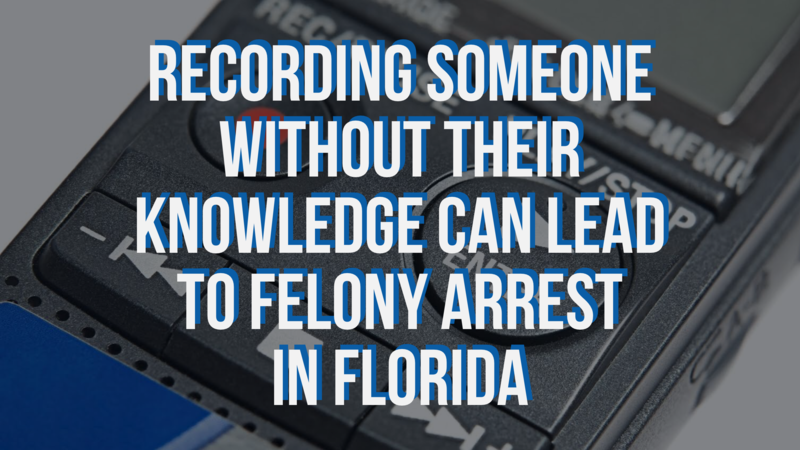 What is the law in the State of Florida as it relates to recording people? What is the law in Florida relating to recording other people’s conversations? Florida Statute Section 934.03 lays out the law as it relates to recording someone’s communications. Florida is a two-party consent state. This means that all of the parties to the conversation must consent to recording of the conversation for the act of recording to be legal. A person who violates this law can be charged with a third degree felony punishable by up to five years in prison. 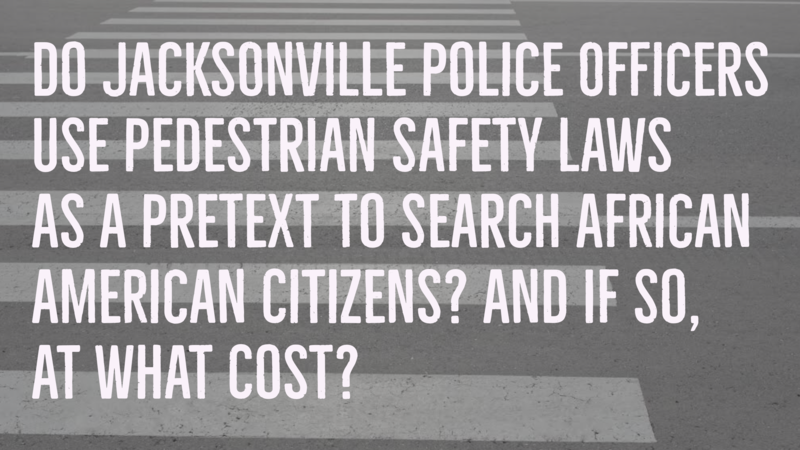 Do Jacksonville Police Officers Use Pedestrian Safety Laws As a Pretext To Search African American Citizens? And If So, At What Cost? 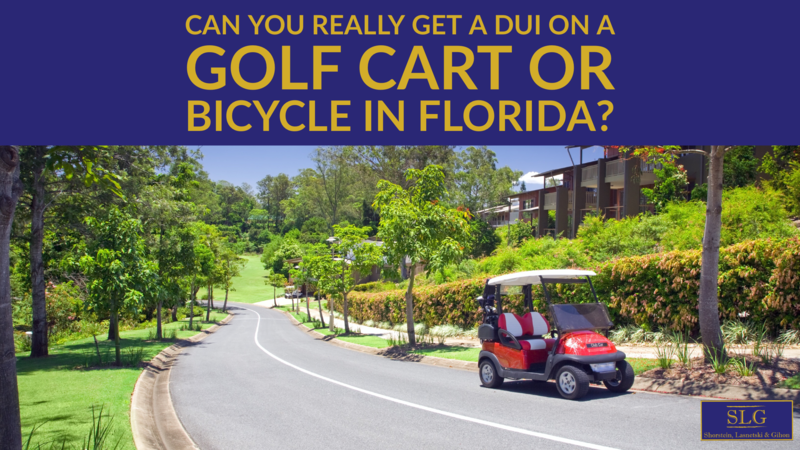 The Florida Time Union released a story with some eye-popping statistics relating to the use of pedestrian citations in the city’s most crime ridden areas of Jacksonville. Jacksonville criminal defense attorneys often challenge these pretextual stops, but the case law continues to generally support the use of profiling, as long as there is a lawful basis for the stop. With so many pedestrian safety statutes on the books, it’s easy for a law enforcement officer to pick and choose who the officer wants to stop and question, under the guise of pedestrian safety. 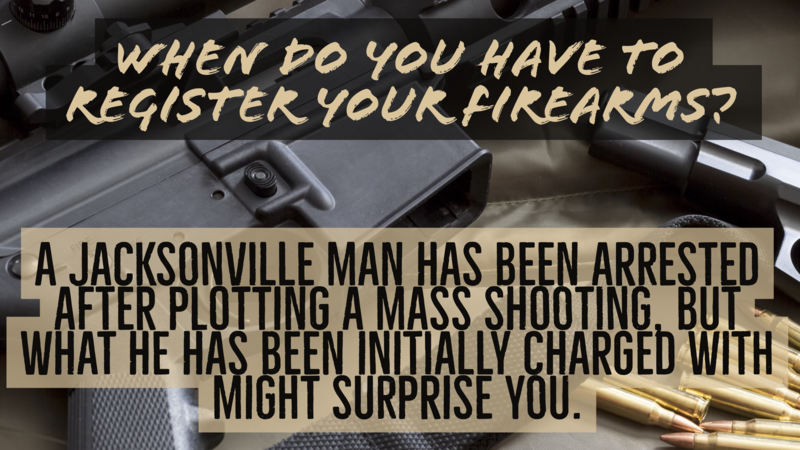 Jacksonville Sheriff’s Officers will often conduct a stop and talk or a stop and frisk search on individuals they believe are suspicious and if they uncover something illegal, they will make an arrest. But what effect does their detention have on a citizen who has done nothing wrong? Won’t that person feel profiled? Unjustly singled out? How big of a group is this? How many citations do the Jacksonville Sheriff’s Office issue where the person was engaged in otherwise lawful conduct and possessed nothing illegal on their person? How many African American citizens have been stopped for violation of a pedestrian safety statute and not issued a citation simply so the Jacksonville Sheriff’s Officer could investigate them further? An African American law abiding citizen living in a high crime area is sure to carry resentment if he or she feels continually harassed or is cited for violations of pedestrian safety statutes that are not enforced in the low crime, white areas of Jacksonville. Also disturbing, is the report that the Jacksonville Sheriff’s Office has been issuing hundreds of citations despite the person not actually violating the statute. Whether this true or not, it seems like the end desire of law enforcement (to drive out crime in crime ridden areas of Jacksonville) is laudable, but some of the methods (pretextual stops and searches) may do more damage than good. So many crimes in predominantly African American, low income neighborhoods require the cooperation of citizens who live in that community. When those people don’t trust law enforcement because of what they consider constant, unjustified harassment, they are less likely to cooperate in a criminal investigation. Murders, rapes, robberies, burglaries can all go unsolved or unprosecuted because the State lacks the witnesses and evidence to proceed. It would seem that if the Jacksonville Sheriff’s Office spent more resources providing more law enforcement officers for those particular areas that need them the most and if those law enforcement officers developed, groomed, and maintained positive relationships with the citizens of those communities, more crimes would get solved and successfully prosecuted. Florida Gator head football coach recently told the media that he has received death threats following a few losses on the field. 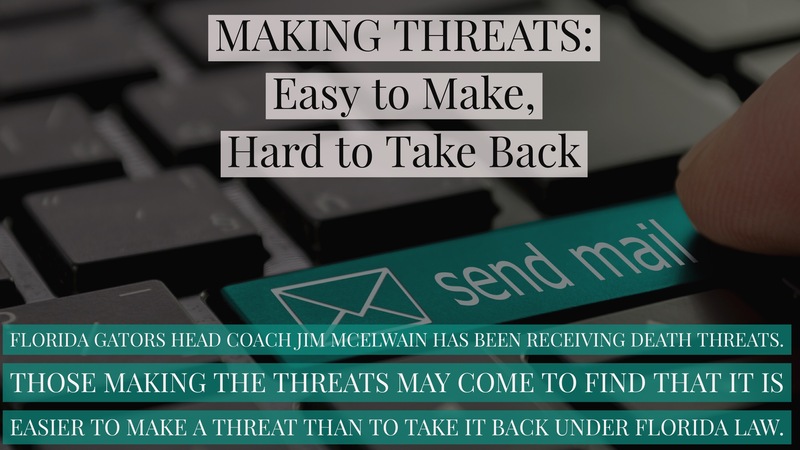 Coach Mac shrugged those threats off as part of the job, but he is probably quite concerned for the safety of his family. So what protection does Coach Mac have if law enforcement were able to track down the people responsible? Well, there is a huge distinction in Florida law between written threats and verbal threats. Written threats are treated much more harshly than verbal threats in the State of Florida. Once they are made (and often they are made in a spur of the moment fit of anger or frustration with no intent to carry through with the threat), they often leave a trail of evidence that leads back to the author. So what are written threats under Florida law? 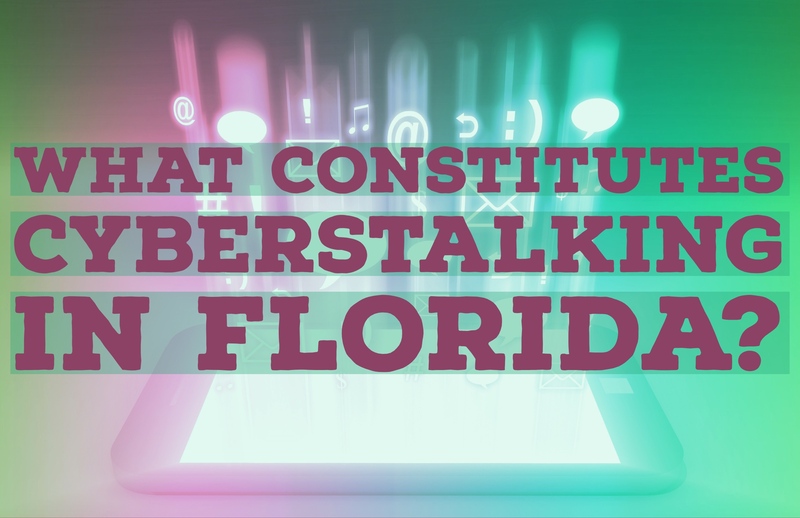 What Constitutes Cyberstalking in Florida? A 20 year old student at the University of North Florida was recently the victim of a man who created fake social media accounts using her name and likeness. Her Facebook photos were used to create fake social media accounts on Instagram and Tinder. The fake accounts requested money be sent and stated that the victim was “sexually ready.” So, was this a crime? And if so, what crime was it? 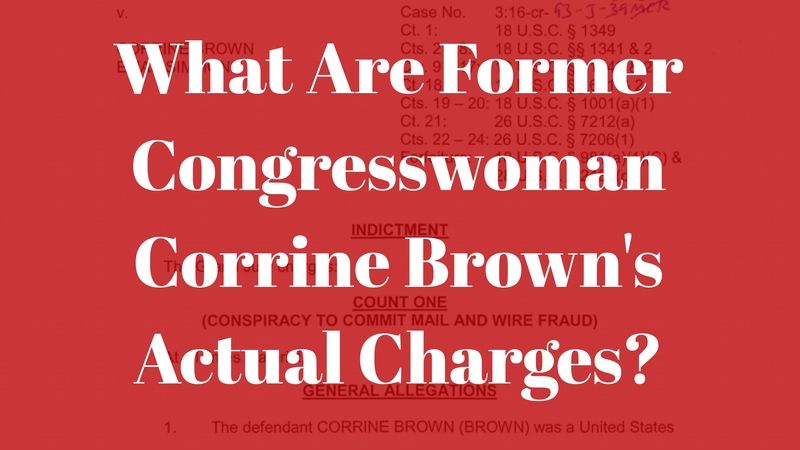 What Are Former Congresswoman Corrine Brown’s Actual Charges? On July 6th, 2016, Corrine Brown, along with Elias Simmons, was indicted on a twenty four (24) count federal indictment. You heard me right, folks. 24 counts. The charges all stem from her relationship with a organization called the One Door for Education – Amy Anderson Scholarship Fund. The basic allegations are that Corrine Brown, when she was a congresswoman, would solicit contributions to this fund. 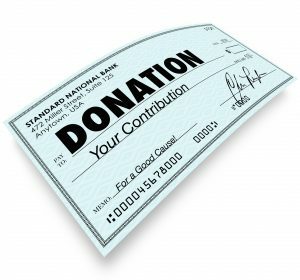 The proceeds from the contributions were supposed to go to scholarships. The government has alleged that the vast majority of the money taken into this scholarship fund went into the pockets of Corrine Brown, Elias Simmons and others. Specifically, the federal government has alleged that out of approximately $800,000 contributed to the fund, only about $10,000 went to actual scholarships. So let’s break this down and look at the various charges. The Government alleges that Corrine Brown and others solicited money into the One Door for Education Scholarship Fund and then deposited some of those proceeds into their personal accounts for personal use.